Marie Josephe David, 2nd daughter and 4th child of Jean Pierre David and Marie Magdelaine Monmellian, was born on 08 November 1722 in Louisbourg and baptized the following day, 09 November 1722. Her godparents were Philippe Carrerot, store-keeper for the King, and the widow Madame Marie Bertrand de Villejoin. Fre Claude Sanquet, Recoleta Commissioner and Vicar General presided at the baptism. By 1722, Jean Pierre and Marie Magdelaine had now arrived and established their home at the Fortress of Louisbourg. There, the family continued to prosper and grow with the birth of Marie Josephe's 3rd brother, Jean Jacques on 19 June 1724. Marie Josephe's presence in Louisbourg is indirectly recorded in the Louisbourg 1724 Census which lists her father, Jean David dit Saint Michel of Nantes, a blacksmith, a wife, Marie Magdelaine Monmellian, 3 sons under 15, Pierre, Michel and Jean Jacques and 2 daughters, Magdeleine and Marie Josephe. In 1725, the family of Jean and Marie blessed with the birth of Marie Josephe's 4th brother, Jean Baptiste on 22 July 1725. In addition, the Louisbourg 1726 Census which also indirectly includes Marie Josephe continues to coincide with the Louisbourg 1724 Census with the addition of Marie Josephe's brother, Jean Baptiste David, to Jean Pierre and Marie Magdelaine's family in 23 July 1725. Between the Louisbourg Census of 1726 and 1734, the births of 4 more children blessed the David dit Saint Michel household, Francois on 16 June 1727, Francoise Charlotte on 10 April 1729, Etienne Thomas on 21 December 1730 and Louis on 02 September 1732. According to the Fortress of Louisbourg Historical Memoranda Series 1964 to Present H F 25 1989 titled Jean Pierre David dit Saint Michel: Blacksmith authored by Eric Krause of Krause House Info-Research Solutions, Jean Pierre and Marie Magdelaine were still living at Louisbourg in 1744 along with their surviving children of 5 boys for certain, possibly 6 and 5 girls. These children would probably have included their sons Jean Jacques, Jean Baptiste, Francois, Louis, Claude Thomas and Jacques Andre and their daughters Marie Josephe, Francoise Charlotte, Jeanne Olive, Marie Magdeleine and Jeanne Angelique. The "possibly \ 6" son referred to was probably Michel who married Genevieve Hebert on 20 January 1744 in Grand-Pré, Acadie and was probably living there with his wife. 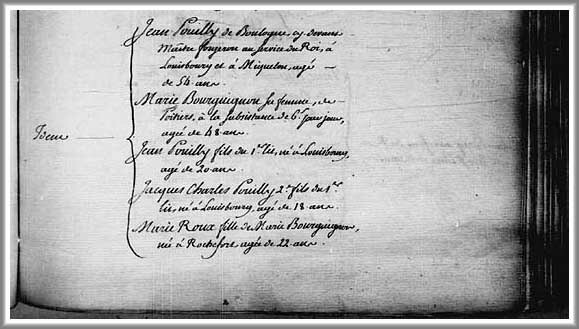 Jean Pouilly, 1st son and 1st child of Jean Paul Pouilly and Marie Josephe David, was born on 20 April 1752 in Louisbourg and baptized the following day, 20 April 1752. His godparents were his grandfather, Jean David, and Marie Jeanne Grenard. 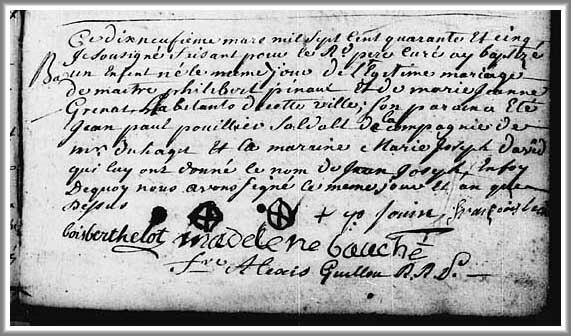 Signatures attending the baptism included Nicolas Colin, 1st husband of Francoise Charlotte David, Marie Josephe's sister. Fre Isidore Caulet presided at the baptism. Jacques Charles Pouilly, 2nd son and 2nd child of Jean Paul Pouilly and Marie Josephe David, was born on 31 December 1753 in Louisbourg and baptized the following day, New Years Day, 1 January 1754. His godparents were Jacques Doulliez, and Francoise Charlotte David, Marie Josephe's younger sister. 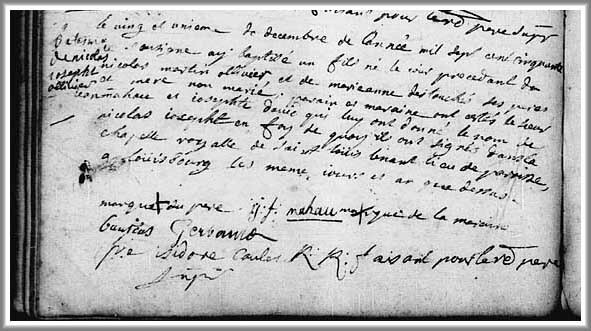 Signatures attending the baptism included Nicoles Gotirn and Nicolas Colin, 1st husband of Francoise Charlotte. Fre Isidore Caulet presided at the baptism. Claire Francoise Pouilly, 1st daughter and 3rd child of Jean Paul Pouilly and Marie Josephe David, was born on 13 June 1755 in Louisbourg and baptized the same day. Her godparents were Francois LeLievre, and Claire Pinaut. Signatures attending the baptism included Francois LeLievre, Nicolas Colin, La V Droit and Louis Gautier. Fre Isidore Caulet presided at the baptism. Anne Louise Pouilly, 2nd daughter and 4th child of Jean Paul Pouilly and Marie Josephe David, was born on 30 December 1757 in Louisbourg and baptized the same day. Her godparents were Louis David, Marie Josephe's brother, and Annette Gourdon. Signatures attending the baptism included Jean Latapy. Fre Patrice LaGree presided at the baptism. After the 2nd siege of Louisbourg on 26 July 1758, the British began rounding up all French and Acadian inhabitants on Île Saint-Jean in preparation for their deportation to France. 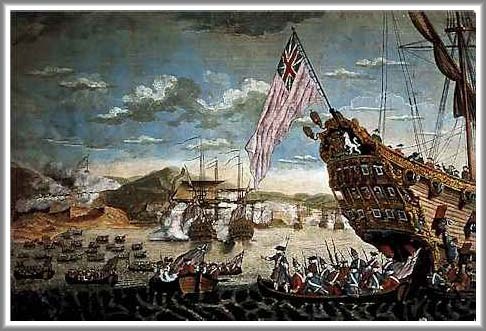 Between September and October of 1758, about 3,100 inhabitants were captured and deported on 13 ships bound for French or English ports. It is believed that Jean Paul and Marie Josephe and their 4 children were deported on the 1st wave of ships bound for France. Of the 3,100 Acadians deported to France at that time, it is said that only about 1,500 survived the crossing while the remainder died at sea due to drowning, disease or illness. Although no primary source ship's manifest has been uncovered listing the family of Jean Paul and Marie Josephe's deportation departure from Louisbourg, their arrival in France in the fall of 1758 is tragically recorded in 2 primary source burial records of Marie Josephe and her 2nd daughter, Anne Louise Pouilly, at the parish of St-Louis de Rochefort, Charente-Maritime, Rochefort, France. Whether Marie Josephe David, at the age of 35 years, died during the Pouilly families' deportation voyage from Louisbourg to France, her burial is recorded on 10 October 1758 at the parish of St-Louis de Rochefort, Charente-Maritime, Rochefort, France. Exactly a month after her mother's death and burial, Anne Louise Pouilly, at the infant age of 10 months, died and her burial on 10 November 1758 is also recorded at the parish of St-Louis de Rochefort, Charente-Maritime, Rochefort, France. The approximate date of the Louisbourg expulsion departure to the dates of the primary source burial records of Marie Josephe and Anne Louise in Rochefort, France seem to coincide with the 6 to 9 weeks required for ship's voyage between Nouvelle France and France during the mid-18th century. Whether these deaths occurred during the voyage or after arrival at Rochefort is unknown at this time. For the 12 years between 1758 and 1770 virtually nothing is known of the surviving members of the Pouilly family in France. There are some indications in the primary source records below that the family may have spent part of this time in Saint-Pierre and Miquelon as these locations are mentioned within these records. 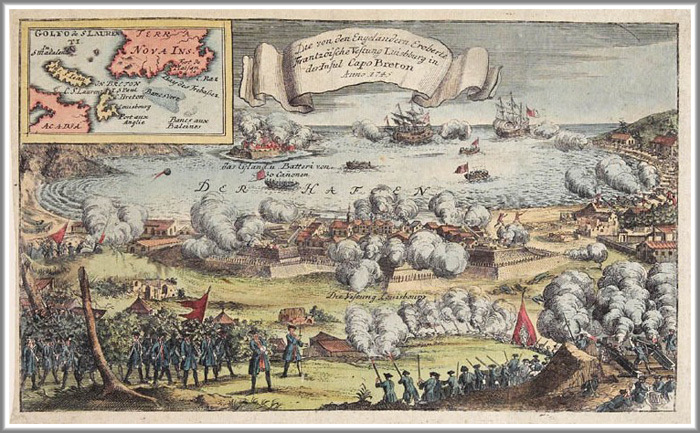 As further evidence of the family's arrival in France after the 2nd siege of Louisbourg in 1758, 6 related primary source records have been uncovered, dated between the years of 1770 and 1774, which establishes Jean Paul and his surviving children's presence in Rochefort and Saint-Malo, France during that period of time. 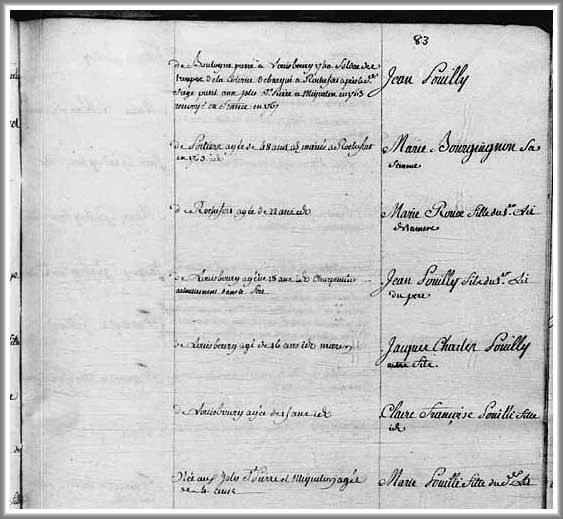 By 1770, it appears that Jean Paul had remarried to a Marie Bourgingnon, who along with Jean Paul, his 3 surviving children from Marie Josephe, Jean, Jacques Charles and Claire Francoise, a Marie Roux and a Marie Pouilli were listed in a register of the "State of review of the families of Canada and Acadie residing in Rochefort on 8 January 1770". On 4 September 1771, Claire-Francoise Pouilly was issued a travel passport by the Commissioner of the Navy authorizing her to travel from Rochefort to Saint-Malo, France. From that date on, Claire-Francoise's name does not appear in any of the Pouilly family primary source records uncovered to date. Although the primary source record image of this passport exists, it cannot be accessed at this time. However, the description record of this source record is accessable on the Archives of Canada France website. The reason why Claire-Francoise, at the age of 16 years, would leave her father and brothers in Rochefort and travel to Saint-Malo is unknown. However, there is the possibility that her travel to Saint-Malo could have been to live with her aunt, Francoise Charlotte David, the younger sister of her mother, Marie Josephe. A primary source document issued by The Commissioner of the Navy of the Colonies dated 19 November 1765 appears to establish Francoise Charlotte's presence in Saint-Malo by 1765. Upon Charlotte's destitute return to France from French Guyana in the fall of 1765, after the untimely death in 1764 of her husband, Jean Baptiste DeBroise, this document appears to grant Francoise Charlotte forgiveness of the debt of a loan made in 1762 by her husband to a sponsor on behalf of King Louis XV to finance the building of a saw mill in Kourour, French Guyana. In addition within this document, Francoise Charlotte's request for a monthly French government pension for her subsistence is endorsed by the Bishop of Saint-Malo. Furthermore, unconfirmed primary source records have been uncovered for the years 1766, 1768, 1769, 1770 and 1771 which document a Francoise David in Saint-Enogat, Ille-et-Vilaine, Bretagne, France located within 10 miles of Saint-Malo. 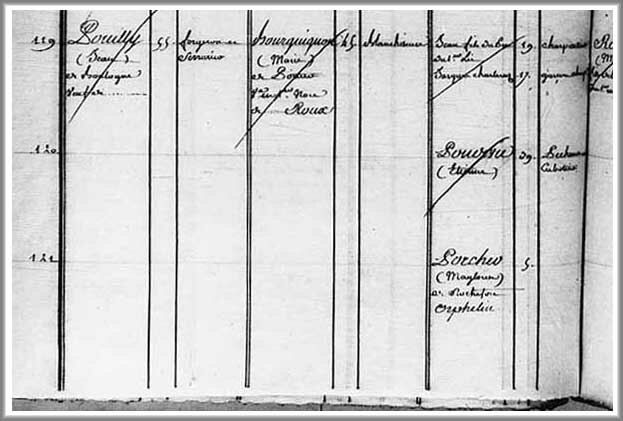 On 15 May 1772, the Jean Paul Pouilly family, including Jean Paul, Marie Bourgingnon, Jean, Jacques Charles and Marie Roux appear on the "List of individuals who make up the resident Acadian families in Rochefort and La Rochelle while waiting for a destination" and who are receiving a pension for daily subsistence and housing from the French government. Claire-Francoise does not appear on this list. 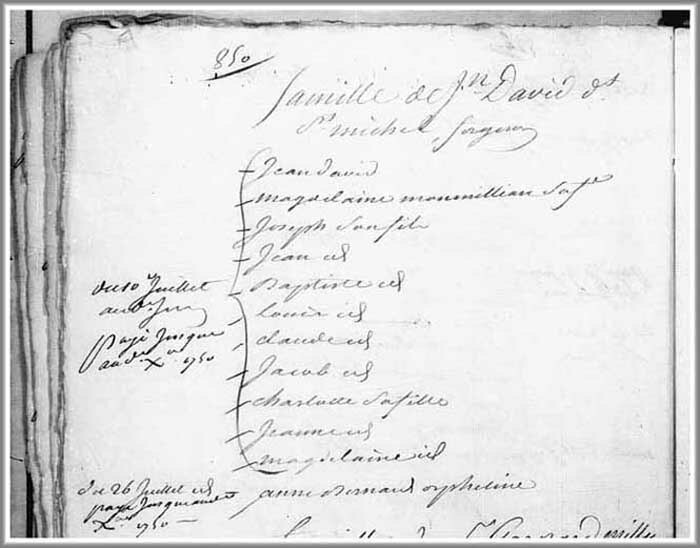 On 15 September 1772, the presence of Jean Paul Pouilly's family in Rochefort is listed once again in the register below entitled the "Roles of families who are not from Acadie were excluded entirely from the role of each of these Acadian families, with observations to determine the preservation of the aid of subsistence they enjoy....". It is not clear at this point whether the Pouilly family was considered one of these families at risk of losing their pension. However, as mentioned in the 08 January 1770 primary source record above, there are some indications that the family may have spent time in Saint-Pierre and Miquelon after arriving in Rochefort which could be a factor in their pension being abolished in 1773. As observed in the 15 September 1772 primary source record above, the Pouilly family was, in fact, listed in the "List of North American families living in Rochefort and La Rochelle, whose pensions were abolished on 13 February 1773. Once again, this source documents members of Jean Paul's family as from locations, i.e., Saint-Pierre and Miquelon, other than Acadie which may have been the cause of their pension being abolished. On 23 March 1774, a primary source memorandum for the "verification of the roles of subsistence to the Acadians who fled to France and observations on a number of cases" once again appears to reference a Pouilly family member in Saint Malo. The partial translation of this source document mentions 3 interesting observations which lead one to believe that this document could be referring to life events of either Claire Francoise Pouilly, her aunt, Francoise Charlotte David DeBroise, or both. First, the source mentions "the daughter of parents born in Louisbourg who lost all their possessions". This could refer to Claire Francoise and the destitute family of her father, Jean Paul Pouilly, who lost their Rochefort pension in 1773. Or could this refer to Fransoise Charlotte who lost all of her worldly possessions with the death of her husband, Jean Baptiste DeBroise, in French Guyana in 1764. Secondly, the source mentions, "she decides on a vocation calling to join the Convent of Dasuer of the Good Shepherd". In either case, Claire or Charlotte answering God's calling could have been a means to an end of their struggles to survive during those troubling times in France. Finally, the source mentions, "she having requested the continuance of subsistence to serve as his dowry, her husband’s continued". By 1774, Claire Francoise would have been about 18 years of age, therefore, mention of a dowry and a husband would have been possible. However, could this source statement also apply to Charlotte's plight to secure government sponsored subsistence in Saint Malo. Until further sources are uncovered, these questions will remain unanswered. After the mention of the Pouilly family name in the 1774 primary source memorandum above, no further trace of this family's whereabouts from that point on has been uncovered to date. Marie Josephe's documented presence in Louisbourg is recorded in a Family Reconstitution File of her father, Jean Pierre David, which is archived at the Fortress of Louisbourg National Historic Site of Canada. This Family Reconstitution File was abstracted and compiled from original source documents archived at the Archives of Canadian and the Archives Nationale. A Family Reconstitution File for the family of Jean Paul Pouilly and Marie Josephe David, has been researched, abstracted and assembled from original source documents dated between 1751 and 1758 and is available on the research website for the Fortress of Louisbourg National Historic Site of Canada. Marie Josephe, appears to have been well known and respected within the social and religious communities of Louisbourg. This is evident from the numerous original source documents recorded by priests at Louisbourg. Besides being recorded in the baptism records of her own 4 children from 1752 to 1757, she was also listed as godmother in baptism records of 4 children of close friends at Louisbourg from 1745 to 1754. Marie Josephe's 1st recorded godchild was Jean Joseph Pinaut, born, the son of Master Philibert Pinaut, resident of this city, and Marie Jeanne Grenat on 19 March 1745 in Louisbourg and baptized the same day. At the young adult age of 22, this could very well have been a 1st meeting with Marie Josephe's future husband, Jean Paul Pouillier, soldier of the company of Mr. Duhaget and godfather to Jean Joseph. A little over 6 years later Marie Josephe and Jean Paul would marry in Louisbourg on 1 June 1751. Fre Alexis Guillon (R.R.P.) presided at this baptism. Witnesses attending the baptism were Madelene Bouche, Francois Le Cou and Lois Berthelot. 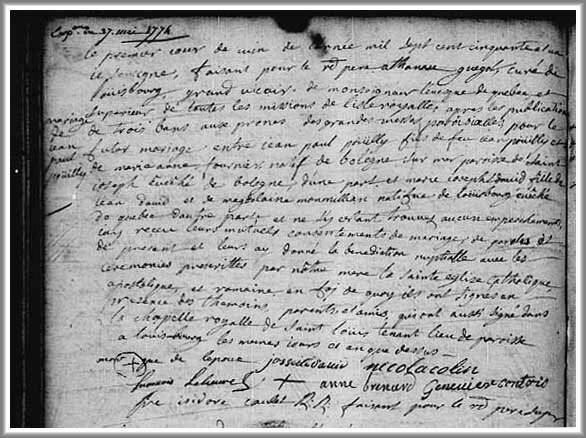 The 2nd recording of a Marie David as godmother is in the baptism record of Marie Arnauite Senat, born, the daughter of Jean Senat and Thoinette Dutour on 14 December 1750 in Louisbourg and baptized on 15 December 1750. The godparents recorded at this baptism were Arnault Pugent and Marie David. Fre Isidore Caulet presided at this baptism for t he Father Superior. Witnesses attending the baptism were Pugent, Jean Senat, father, Madelene Gri and Pierre Fontan. The Marie David recorded in this baptism record may not have been Marie Josephe. At this time, there lived in Louisbourg another Marie David who was born about 1706 and recorded to have died in Louisbourg on 28 May 1751 at the age of 45 years. All other known recordings for Jean Pierre's 2nd daughter were always recorded as Marie Josephe David. 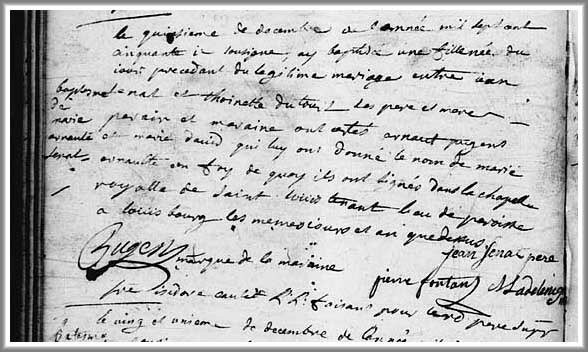 The 3rd recording of a Josephe David as godmother is in the baptism record of Nicolas Joseph Ollivier, born the illegitimate son of Nicolas Martin Ollivier and Marie Anne Destouches on 20 December 1750 in Louisbourg and baptized on 21 December 1750. The godparents recorded at this baptism were Sieur Jean Mahau and Josephe David. Fre Isidore Caulet presided at this baptism for the Father Superior. Witnesses attending the baptism were J.F. Mahau, Baurias and Gerbanio. This baptism record is the only indication yet uncovered that Marie Josephe may have been illiterate and could not write. The record illustrates that Marie Josephe signed this baptism record with an "X" where the "mark of the godmother", i.e., "marque de la marrine" is noted at the end of the record. It might be noted that the child's father, Nicolas Martin Ollivier, also signed his name with an "X" over the "mark of the father", i.e., "marque du pere". Marie Josephe's 4th recorded godchild was Francois Joseph Le Roi, born, the son of Jan Le Roi and Perpetue Le Juenne, Spanish inhabitants, on 18 January 1754 in Louisbourg and baptized almost 6 months later on 7 July 1754. The godparents recorded at this baptism were Francois Millian and Josephe David. Fre Pierre D'Aleantara Cabaret presided at this baptism. The witness attending the baptism was Pierre Villedonne. Jean Paul Pouilly, born at Boulogne, Champagne, France to Jean Pouilly and Marie Anne Fourniere, natives of Boulogne-sur-Mer, France, parish of Saint Joseph Bishopric of Boulogne. His date of birth and baptism is yet unknown as is his date and place of death. 1. Jean, a son born on 21 Apr 1752 at the Fortress of Louisbourg. The date and place of his death is unknown at this time. 2. Jacques Charles, a son born on 01 Jan 1754 at the Fortress of Louisbourg. The date and place of his death is unknown at this time. 3. Claire Francoise, a daughter born on 13 Jun 1755 at the Fortress of Louisbourg. The date and place of her death is unknown at this time. 4. Anne Louise a daughter born on 30 Dec 1757 at the Fortress of Louisbourg . It is believed she died at the infant age of 10 months on 10 November 1758 at St-Louis de Rochefort, Charente-Maritime, France.